People familiar with Antibes’ Billionaire’s Wharf (le quai des milliardaires) know that it’s the place in the harbor of Antibes where one doesn’t keep boats: here, we’re talking ships, and big ones at that. 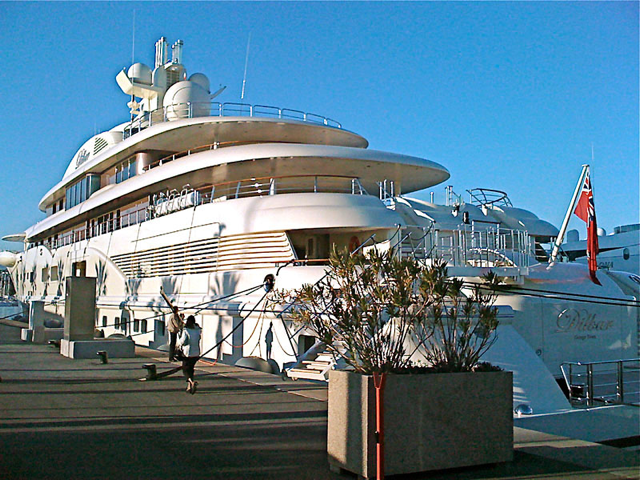 Even knowing that, we were stunned to discover the Dilbar, a gorgeous and brand new (built in 2008) yacht. At 110 meters (just over 260 feet), the Dilbar is, at the time of writing, the 26th largest yacht in the world. Apparently, it belongs to a Russian entrepreneur who thought his previous yacht was getting a little cramped. True, it was only 60 meters (197 feet) long... We'd love to visit some of these ships, but sadly, we don’t move in the same circles as the owners..